There is a wide selection of grow media to choose from. Knowing which one works best for your garden is important for a successful grow. Derived from the hull of a coconut, coco coir husk is one of the most prominent growing media on the market today, especially from a soilless standpoint. Coco coir is 100% natural and renewable. What is coco coir used for? Coco coir, referred to as coco for short, is many growers go to indoor growing media. It is prized for its ability to hold water, while still promoting excellent aeration and drainage. Coco is also environmentally friendly and renewable, unlike other soilless mixes. Coco can last up to three times longer than other soils or soilless options, and comes in different forms. Coco coir fibers are very common, and are pure coco coir. At Hydrobuilder, we also offer coco coir mixes, which are coco compounded with another medium, most often potting soil or perlite. Growers can use coco as a potting soil or in the ground, as it performs well indoors and outdoors. For hydroponic systems, we have hydroponic coco options. What is the pH of coco coir? While other soilless mixes tend to be more acidic and require more regular pH monitoring and the use of pH adjustors, coco is pH neutral. Generally, coco coir will range from 5.2-6.8 pH. From a nutritional standpoint, coco contains a plethora of micronutrients and since it is derived from a plant itself, contains many growth enhancers that benefit the plants potted in it as well. Can you mix coco coir with soil? Blending coco with soil is a great way to get the benefits of coco and soil simultaneously. After you soak your coco, you can make a 50/50 mix with soil in a pot or container. If you are looking for soilless coco options, consider a soilless potting mix. What is a soilless potting mix? 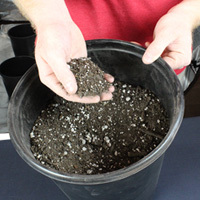 A soilless potting mix is a great way to provide a balanced growing medium to your plants. Our soilless mixes here at Hydrobuilder are a blend of coco coir, perlite, and occasionally other natural compounds, such as earthworm castings. A soilless mix of coco and perlite is one of the best ways to cultivate plants. It provides a perfect ratio of retention and drainage, keeping the root zone perfectly moist. Soilless mixes are prized for their exceptional aeration abilities as well. If you want to learn more about coco coir husk and its many features, check out the article in our learning center where we break this grow medium down even further! If you have any questions, reach out to our experienced growing staff at 888-815-9763. Special Price $4.60 on sale until 4/30/2019! Special Price $802.51 on sale until 4/30/2019! Special Price $503.08 on sale until 4/30/2019! Special Price $743.78 on sale until 4/30/2019!